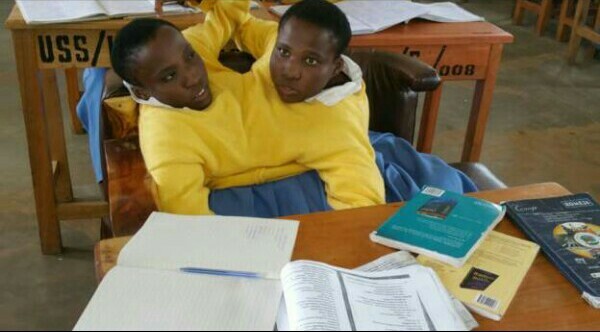 19-year old siamese twins Maria and Consolata Mwakikuti, from Tanzania, now in their final year in high school, are planning to become teachers, BBC reports. The pair are studying in Iringa Udzungwa in Tanzania’s south-west region. They lost their mother after she gave birth to them, and their father soon passed away. A Catholic church charity, Maria Consolata, adopted them and gave them their names. BBC’s Leonard Mubali who visited the girls at their school, said that they got along well with their classmates taking an active part in the lessons. The girls hope to get married to one husband in the future, the report states. Mubali said the girls are against the idea of being surgically separated. According to Edward Fue, the headmaster of the school they attend, the local government supported the school to build facilities to accommodate them. Fue said they also hired a driver to take them to where they live.